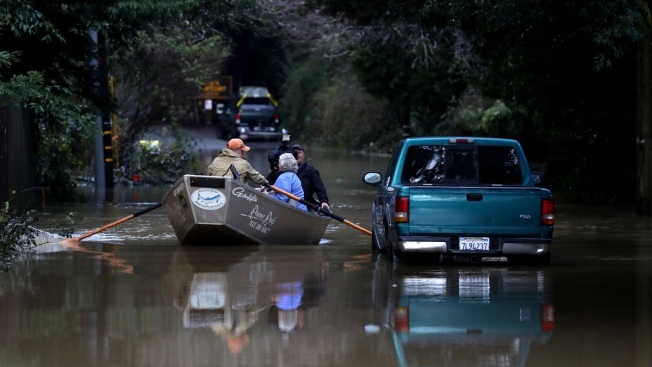 In this Feb. 15, 2019, file photo, residents use a boat to navigate floodwaters in Guerneville, California. An atmospheric river, a narrow corridor of concentrated moisture in the atmosphere, is bringing heavy rains to Northern California that is causing rivers to overflow their banks and flood many areas around the Russian River. A California town north of San Francisco is accessible only by boat after a rain-swollen river overflowed its banks inundated it overnight, authorities said Wednesday. "Guerneville is officially an island," the Sonoma Sheriff's Office said in a statement, adding that all roads leading to it are covered by water from the Russian River, which was forecast to swell more throughout the day. The river topped 32 feet Tuesday evening and it could crest at more than 46 feet by Wednesday night, which would be the highest level in about a quarter-century. About 4,000 residents of Guerneville and two dozen other communities along the river were ordered to evacuate Tuesday evening. There also was concern about potential mudslides in hillside areas saturated from days of downpours, and in areas scarred by 2017 wildfires. A mudslide Tuesday near the community of Monte Rio near Guerneville trapped a man and a woman before they were rescued, messy but unharmed. Elsewhere in the area, several people had to be rescued from cars stranded while motorists tried to drive through flooded roads, including a woman who was rescued by boat. "We've spent lots of time pulling people out of cars that drive into the water and they get stuck and we got to pull them out," Monte Rio Fire Chief Steve Barman told KTUV-TV. "I wish people would pay attention to signs that say 'flooded do not drive into the water.'" Monte Rio was also isolated by water on Wednesday, with all roads leading into it flooded, Barman said. Dee Rydberg on Tuesday removed computers and printers from her business, Guerneville Graphics and Printing. "I could not afford to buy flood insurance," she said. "So I'm packing up my stuff and getting out." Other waterways, including the Napa River, also were expected to overflow their banks as an ocean-spanning plume of moisture continued tracking through the West. Snow from the storms closed roads and schools and toppled trucks and trees from Oregon to Montana. 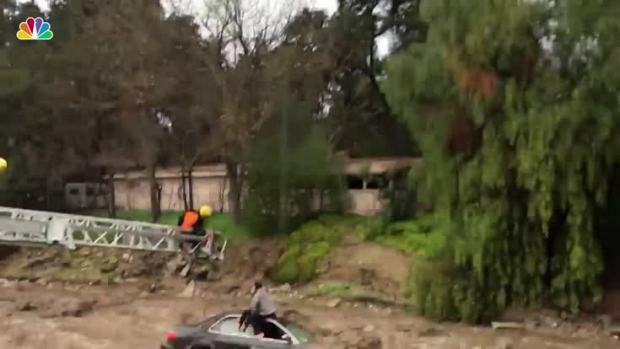 The National Weather Service also issued flood warnings and flash flood watches through Thursday morning for the San Francisco Bay Area and many parts of the Sacramento area.